by Tommy Goudge (July 26, 2013) – 109 drivers signed in to race on “Christmas in July” night presented by McDonald’s of Paris & Brantford at Ohsweken Speedway on Friday night. Mitch Brown, Jack Myers, Rodney Rutherford, and Tim DeBoer all visited Klotz Canada Synthetic Lubricants Victory Lane for the first time this season. Mitch Brown and Glenn Styres started the Sprint Car feature on the front row, and Styres took an early lead. Styres’ attempt at a fourth feature win at Ohsweken this season was stopped when he made hard contact with Scott Sherk, who had spun in turn 1. Brown held the lead for the remainder of the race, while Jim Huppunen, Jamie Turner, Todd Hoddick, and Havard Daniels chased him across the finish line. Heat races for the 24 car field were claimed by Jim Huppunen, Glenn Styres, and Travis Cunningham, while Mitch Brown won the Nathan Ackland State Farm Insurance “Top Gun” award for accruing the most heat race passing points. AFFORDABLE TOWING & RECOVERY THUNDER STOCKS A wild Thunder Stock feature with several incidents involving top drivers in the standings eventually turned into a duel between Jack Myers and Rob Murray for the feature win. 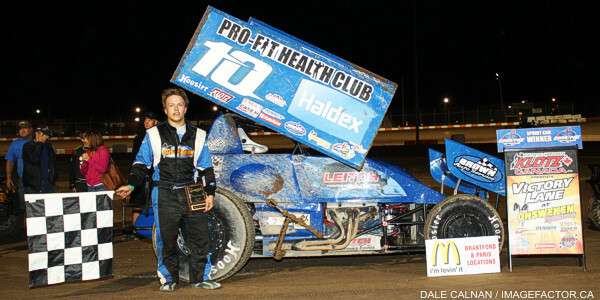 Myers was able to prevail, and claim his first feature win of 2013. Murray settled for the runner-up spot, followed by Ryan Turner, Cory Turner, and Dave Bailey. Heat races for the 39 car field were claimed by Rob Disher, Jack Myers, Mike Thorne, and Chris Dickie, while Jake Brown won the B-Main. Rodney Rutherford brought his pavement car to Ohsweken on Friday, and quickly made his way to the front of the feature from the fourth row. Heat races for the 31 car field were claimed by Brittani Myers, Rodney Rutherford, and Chase Hess, while Mike Evers won the B-Main. Tim DeBoer muscled his way past Max Chechalk late in the Bomber feature, and held on for his first career win. Chechalk settled for second, followed by Dusty DeBoer, Lee Hils, and Gillian Hils. Heat races for the 15 car field were claimed by Max Chechalk and Wayde Thorne. Two big nights of racing at Ohsweken kick off Monday, July 29 as Burger Barn presents the Northern Summer Nationals featuring Tony Stewart with the Corr/Pak Merchandising Sprint Cars, plus DIRTcar 358 Modifieds, HRW Automotive Mini Stocks, and Gale’s Auto Aftermarket Bombers. 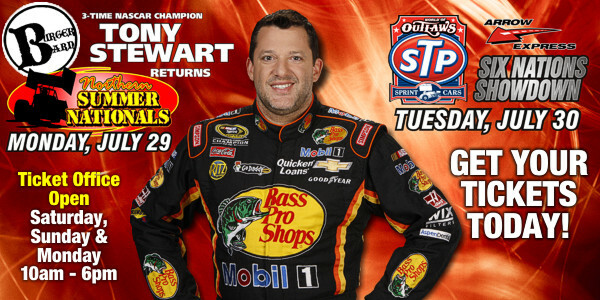 Tuesday, July 30 features the return of the World of Outlaws Sprint Car series for the annual “Six Nations Showdown”, with NASCAR champ Tony Stewart again looking to defend his win in last year’s WoO event at Ohsweken. Advance reserved seat tickets are now on sale for the “Northern Summer Nationals” featuring Tony Stewart on Monday, July 29, the World of Outlaws Sprint Car series “Six Nations Showdown” on Tuesday, July 30, and the 9th annual Canadian Sprint Car Nationals on Friday, September 13, and Saturday, September 14. Please visit www.OhswekenSpeedway.com and check out our new system for online ticket sales. THURSDAY NIGHT MICRO SPRINT RACING AT OHSWEKEN Thursday Night Micro Sprint Racing takes place on the Warm Up Track in the Ohsweken Speedway Pits each week from May 16th to September 5th, and spectator admission is just $5! Visit www.OhswekenSpeedway.com for more information. 1. 14h Jim Huppunen (Fenwick), 2. 52 Jesse Costa (St. Thomas), 3. 81 Derek Jonathan (Lewiston, NY), 4. 5 Keith Dempster (Alton), 5. 01 Mikey Kruchka (Hamilton), 6. 49 Todd Hoddick (Cheektowaga, NY), 7. 5c Conor Mahoney (Waterdown), DNS. 67 Chris Durand (Port Stanley). No Time. 1. 0 Glenn Styres (Ohsweken), 2.  f37 Kyle Moffitt (South Dayton, NY), 3. 11 Jamie Turner (Caistor Centre), 4. 07x Dain Naida (Tecumseh, MI), 5. 7x Jamie Collard (Burford), 6. 27h Tom Huppunen (Fenwick), 7. 90 James Evans (Beamsville), 8. 94 Stan Zanchin (Fort Erie). No Time. 1. 71 Travis Cunningham (Grimsby), 2. 3r Shane Ross (Thedford), 3. 10 Mitch Brown (Brantford), 4. 9nz Havard Daniels (Coatesville, NZ), 5. 80 Chris Steele (Fenwick), 6. 10j Jeremy Hughes (Burlington), 7. 30g Steve Goldner (Aylmer), 8. 43 Scott Sherk (Port Colborne). Time – 1:59.937. 1. 17 Rob Disher (Grimsby), 2. 77 Brett Rodwell (Caledonia), 3. 38 Terry Martin (Ohsweken), 4. 4 Dale Gyokery (Jarvis), 5. 777x Steve Hess (Ohsweken), 6. 68 Aaron Turkey (Ohsweken), 7. 00 Robbie General (Ohsweken), 8. 911 Nick Liverance (Brantford), 9. 23 Trevor DeBoer (Caledonia), DNF. 57 Murray Nicholls (Hamilton). Time – 2:48.019. 1. 33 Jack Myers (Wainfleet), 2. 19 Cory Turner (Caistor Centre), 3. 84rk Ryan Beagle (Vittoria), 4. 28 Jim Lampman (Caistor Centre), 5. 81 Karl Sault (Dundas), 6. 44 Kevin Dawson (Caledonia), 7. 10 Jake Brown (Brantford), 8. 119 Shaun Quinn (Caledonia), 9. 3b Blaine Barrow (Welland), DNF. 11r Bryce Richardson (Port Colborne). Time – 2:42.575. 1. 55 Mike Thorne (Caledonia), 2. 2 Lee Winger (Caledonia), 3. 91 Ryan Turner (Caistor Centre), 4. 12 Brad Herron (Waterford), 5. 48 Mike Graham (Caledonia), 6. 85b Ryan Dinning (Caledonia), 7. 00x Derek Miller (Ohsweken), 8. 5h Billy Bleich, Jr. (Port Robinson), 9. 93 Melissa Miller (Ohsweken), 10. 31 Dave Bailey (Hagersville). Time – 2:44.039. 1. 1 Chris Dickie (Brantford), 2. 73 Mike Miller (Cayuga), 3. 85h Brad Bacher (Hagersville), 4. 9 Dave Silverthorn, Jr. (London), 5. m1 Rob Murray (St. Catharines), 6. 04 Wyatt Van Wart (Cambridge), 7. 29 Jim Gracey (Dunnville), 8. 31b Barry Blanchard (Welland), 9. 5d Dylan Peckham (). Time – 2:41.553. (10 laps – Top 8 finishers transferred to A-Feature) 1. 10 Jake Brown, 2. 31 Dave Bailey, 3. 11r Bryce Richardson, 4. 04 Wyatt Van Wart, 5. 44 Kevin Dawson, 6. 00x Derek Miller, 7. 119 Shaun Quinn, 8. 00 Robbie General, 9. 68 Aaron Turkey, 10. 57 Murray Nicholls, 11. 29 Jim Gracey, 12. 85b Ryan Dinning, 13. 5h Billy Bleich, Jr., 14. 31b Barry Blanchard, 15. 3b Blaine Barrow, 16. 93 Melissa Miller, 17. 911 Nick Liverance, 18. 5d Dylan Peckham, DNS. 23 Trevor DeBoer. Time – 3:27.220. MCDONALD’S OF BRANTFORD & PARIS HEAT RACE #1 1. 22 Brittani Myers (Hamilton), 2. 21 Jonathan Ayrton (Hamilton), 3. 29 Lucas Lubin (Hamilton), 4. 16 Jeremy May (Hamilton), 5. 69 Rob Twitchett (Dundas), 6. 76 Jamie Goudge (London), 7. 64 Doug Erskine (Hamilton), 8. 11 Mike Giberson (Caledonia), 9. 84 Jade Pelletier (Wainfleet), DNF. 96t Mike Taylor (), DNS. 1 Kathi Dickie (Brantford). 1. 38 Rodney Rutherford (Waterdown), 2. 99 Robin Elliott (Woodstock), 3. 79 Steve Miller (Paris), 4. 18x Davey Boughton (Carlisle), 5. 05 Dave Goodacre (Brantford), 6. 10 Laura Hughes (Puslinch), 7. 53 Mark Verhuel (), 8. 90 Chad Smelser (Dunnville), 9. Chantelle Hyatt (Millgrove), DNF. 66 Brandon Janssens (Woodstock), DNF 69e Dan Erskine (Caistor Centre). NATHAN ACKLAND STATE FARM INSURANCE HEAT RACE #3 1. 7x Chase Hess (Ohsweken), 2. 7 Jason Lungaro (Hamilton), 3. 81 Alex Schuts (Oakland), 4. 8 Barry Westman (), 5. 37 Rob Hoskins (Harley), 6. 55 Rob Slater (Dundas), 7. 265 Mike Evers (Caledonia), 8. 5 Rick Robinson (Brantford), 9. 9 Kevin Conley (St. Catharines), 10. 02 Mark Czuba (Burlington). (10 laps – Top 6 finishers transferred to A-Feature) 1. 265 Mike Evers, 2. 64 Doug Erskine, 3. 66 Brandon Janssens, 4. 02 Mark Czuba, 5. 1 Kathi Dickie, 6. 96t Mike Taylor, 7. 9 Kevin Conley, 8. 53 Mark Verhuel, 9. 11 Mike Giberson, 10. 90 Chad Smelser, 11. 12 Chantelle Hyatt, 12. 5 Rick Robinson, DNF. 84 Jade Pelletier, DNS. 69e Dan Erskine. 1. 97 Max Chechalk (Hamilton), 2. 32h Lee Hils (Dundas), 3. 43c Chad Foster (Hamilton), 4. 14 Gerald Burnham (), 5. 32 Gillian Hils (Dundas), DNF. 03d Dakota Potts (Waterford), DNF. 36 Skip Brandow (Orwell), DNS. 199 Frank Turkey, Jr. (Ohsweken). 1. 6 Wayde Thorne (Waterford), 2. 23 Dusty DeBoer (Hagersville), 3. 88 Jesse McDonald (Caledonia), 4. 155 Dustin Longboat (Ohsweken), 5. 42 Joe DeBoer (Hagersville), 6. 9 Tim DeBoer (Caledonia), DNS. 66 Brady Longboat (Ohsweken). About Ohsweken Speedway: Founded in 1996, Ohsweken Speedway is a motorsports complex which includes a 3/8 (0.375) mile clay oval track. The facility is owned by the Styres family, and located in the village of Ohsweken, Ontario, Canada. Ohsweken’s weekly Friday night racing program runs from May to September each year, featuring Sprint Cars, Thunder Stocks, Mini Stocks, and Bombers, while the season finishes each year with the annual Canadian Sprint Car Nationals. 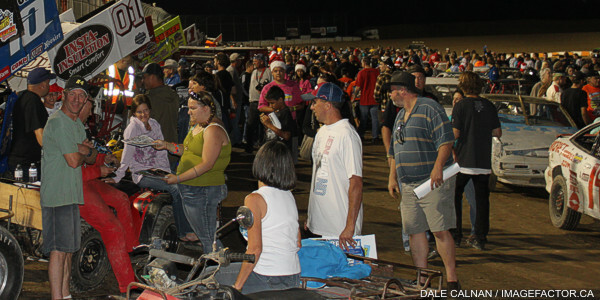 Ohsweken Speedway also hosts weekly Micro Sprint racing on Thursday nights, and has been a yearly stop on the World of Outlaws Sprint Car series schedule since 2007. 2013 season: Arrow Express, Corr/Pak Merchandising Inc., Renway Fuels & Lubricants Heating & Cooling, O’Neil’s Farm Equipment, McDonald’s Restaurants of Paris & Brantford, Nathan Ackland State Farm Insurance, Klotz Canada Synthentic Lubricants, and Burger Barn.